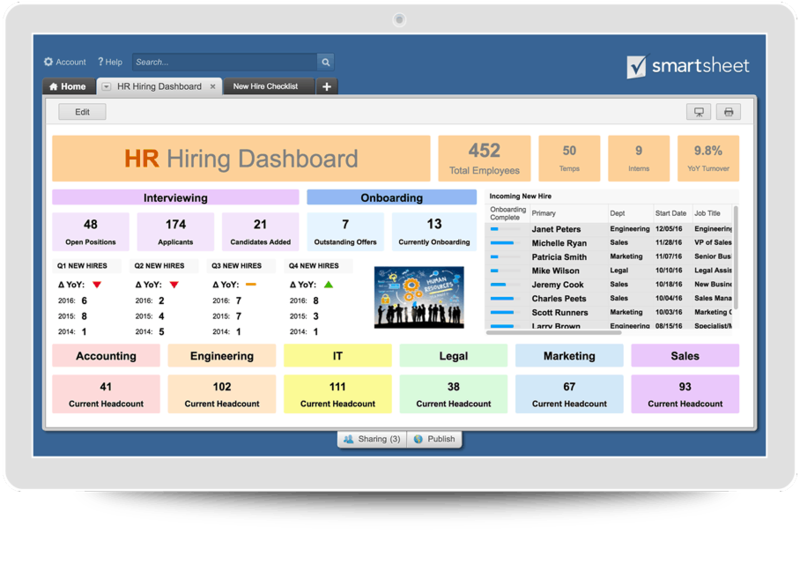 Streamline your hiring process and secure the top talent with Smartsheet. Job interviews provide an opportunity for both employers and applicants to get a sense of whether the position, work environment, organizational culture, and objectives would be a good match. We’ve rounded up the top interview templates for employers, including schedule and question templates, an exit interview template, and scorecards for final evaluations. Templates are available for free download in Excel, Word, PDF, and Google formats. Why Use Interview Evaluation Scorecards? This agenda serves as an interview itinerary template: It breaks down each portion of the interview process into clear steps, identifies who is responsible for each step, and provides a timeline to follow. For group interviews or lengthy agendas, it can be helpful to create an organized outline so that everyone involved in the process is aware of the interview format. Modify the template to create an agenda that suits your organization and the role you are filling. Create a schedule to keep track of interviews with multiple candidates. 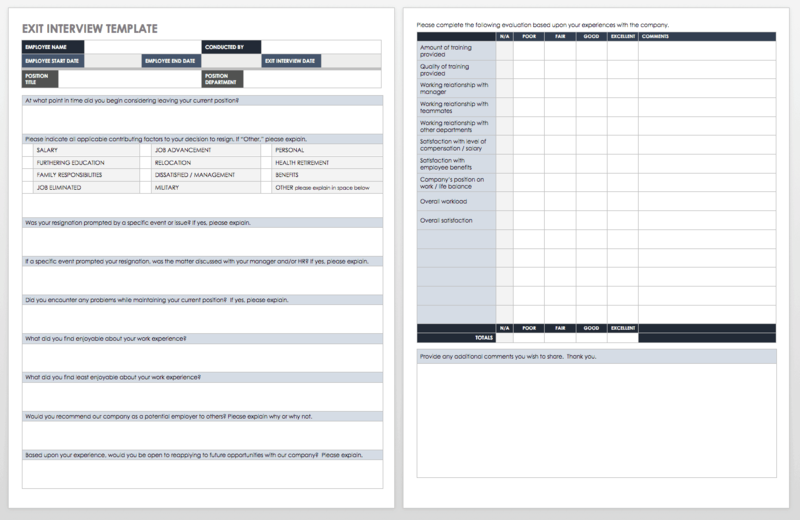 This interview scheduling template can also be used to coordinate several activities for one applicant, such as interviewing with multiple individuals or teams, offering a presentation, or attending other events as part of the interview process. 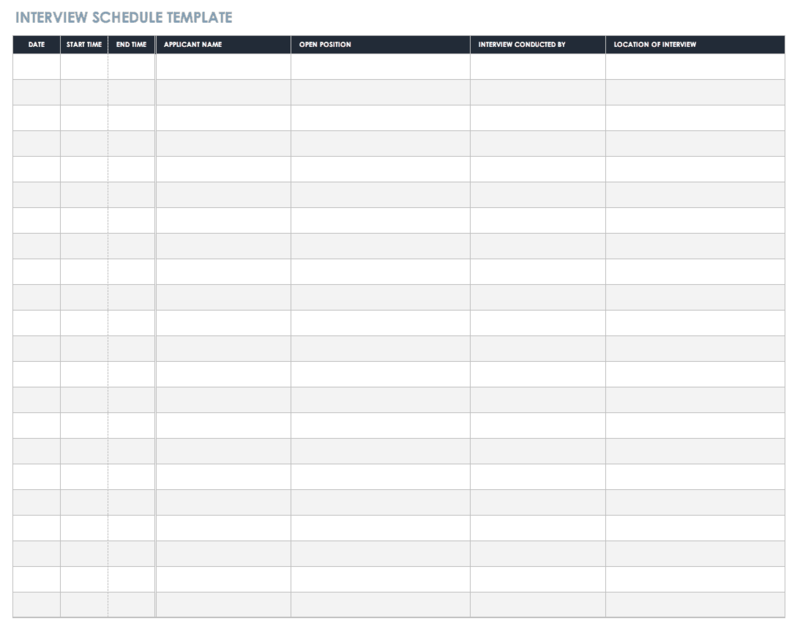 To modify the template, simply edit the headings of each column on the spreadsheet for a customized schedule. This job interview form covers the basics on a single page, with room for questions, a brief evaluation, and notes or recommendations. At the top, add details about the interview, such as the position being applied for, the date and time of the interview, the candidate and interviewer names, and any other details you want to track. 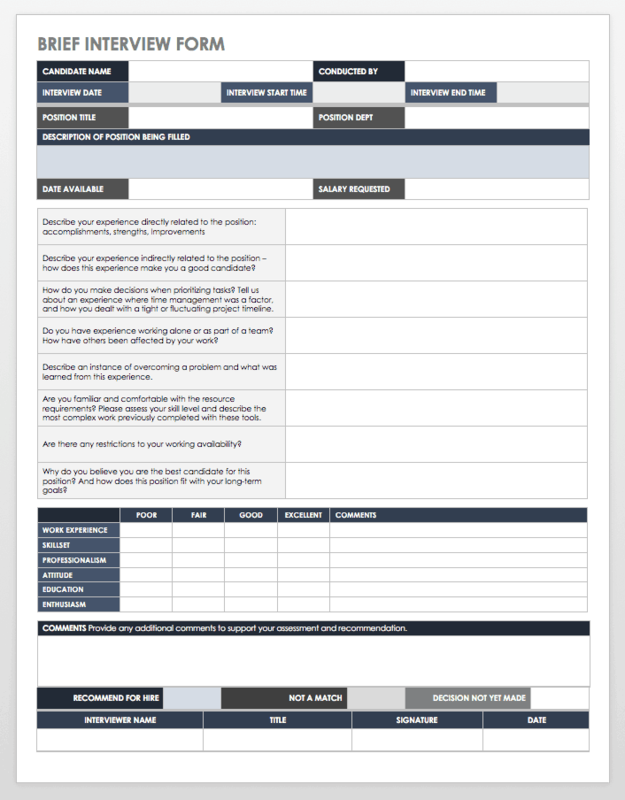 Use the template as a guide to create your own condensed interview form. An interview guide template can walk interviewers through the steps of introducing candidates to the interview process, asking pre-planned questions, evaluating responses, and rating candidates to help decide whether they should move on to the next step toward being hired. 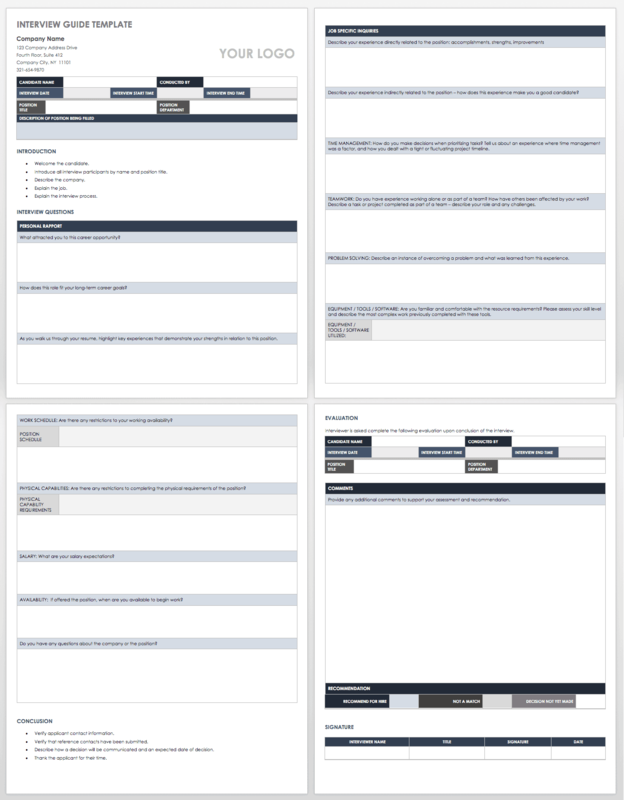 Use this template as an outline to create your own guide, and add a script for interviewers to follow, information that is relevant to the position, and specific questions to determine applicant qualifications. 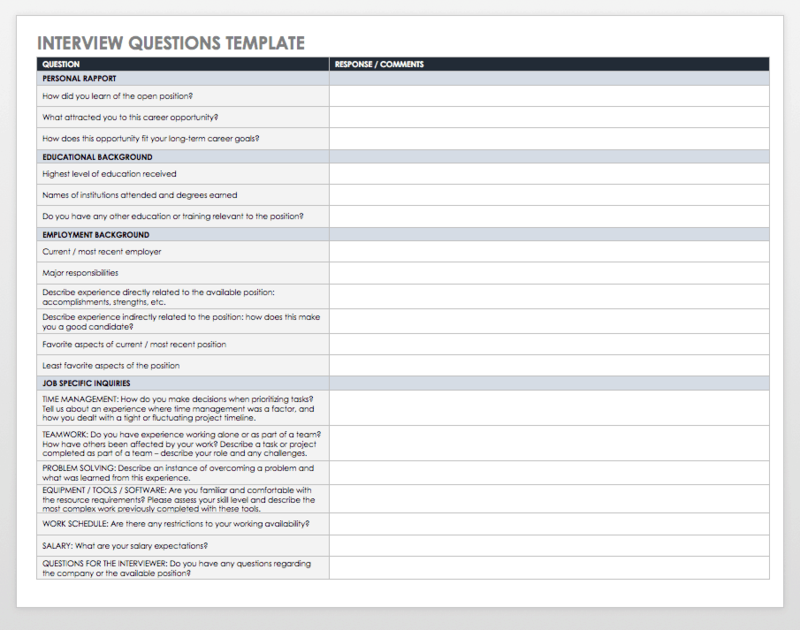 The template includes a basic evaluation scorecard and rating scale as well as room for comments or recommendations. If you need ideas for questions to ask during an interview, use this template as part of your brainstorming process. 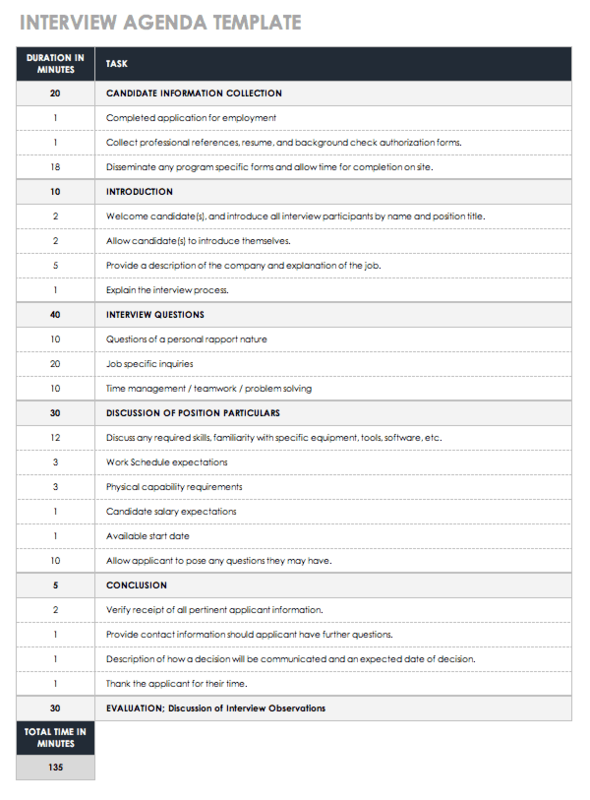 Candidates can also use this template as a practice guide for answering interview questions. The template includes sample questions aimed at gathering information about a range of skills and qualities. Adjust the questions to fit a specific role, industry, and type of interview. Exit interviews are an opportunity for employers to gather information about an employee’s work experience, including feedback on what elements of a job or an organization might need improvement. This template provides a survey for employees who are leaving a job, with questions related to the reason for ending employment, experience at the company, and satisfaction with the job. 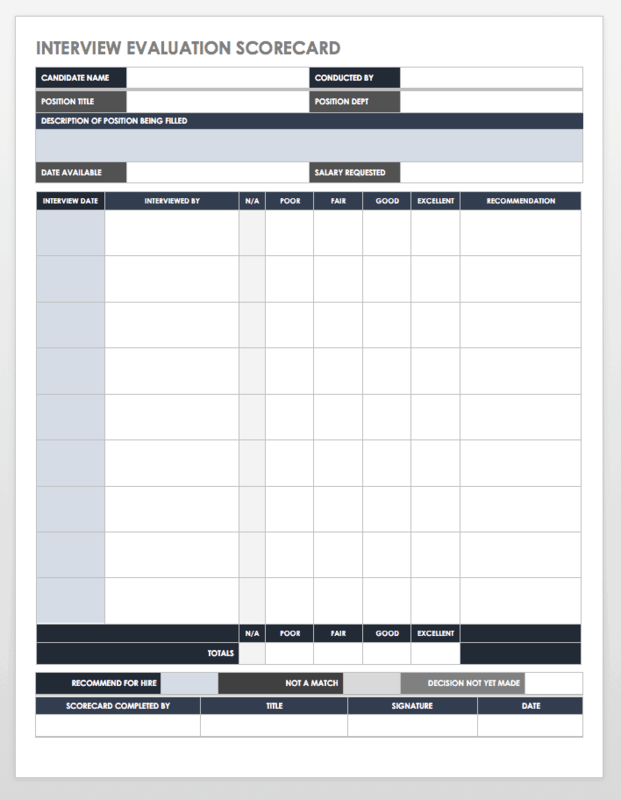 As with the other templates on this page, the template can be tailored to fit the needs of your human resources department. List the core skills and credentials required for a position, along with other qualities that you want to rank, such as communication style, preparation for the interview, or initiative. Evaluate a candidate by assigning a score to each item based on how well they meet the requirements. The template includes a rating scale to indicate whether a competency was absent, average, or excellent. You may also want to include notes to record why you gave a certain score. 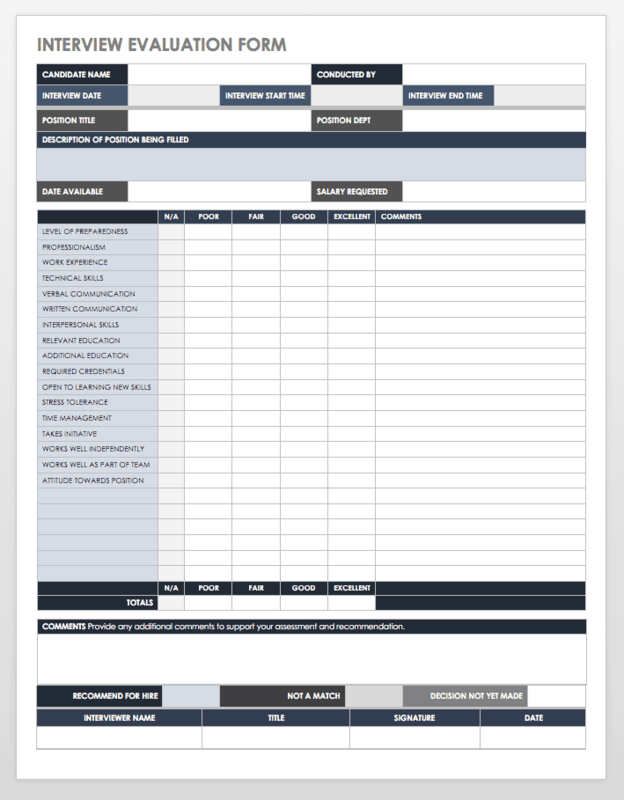 After completing an evaluation form and assigning scores to indicate how a candidate ranks for each requirement, use this scorecard template to add up overall scores and get a quick overview of results. It can also be used to calculate average scores and see how many items received high or low scores. Add notes to support the decisions and recommendations based on the data collected. Once candidates have been ranked for interview performance, relevant experience, skills, and other factors, you can compare their scores to those of other applicants. 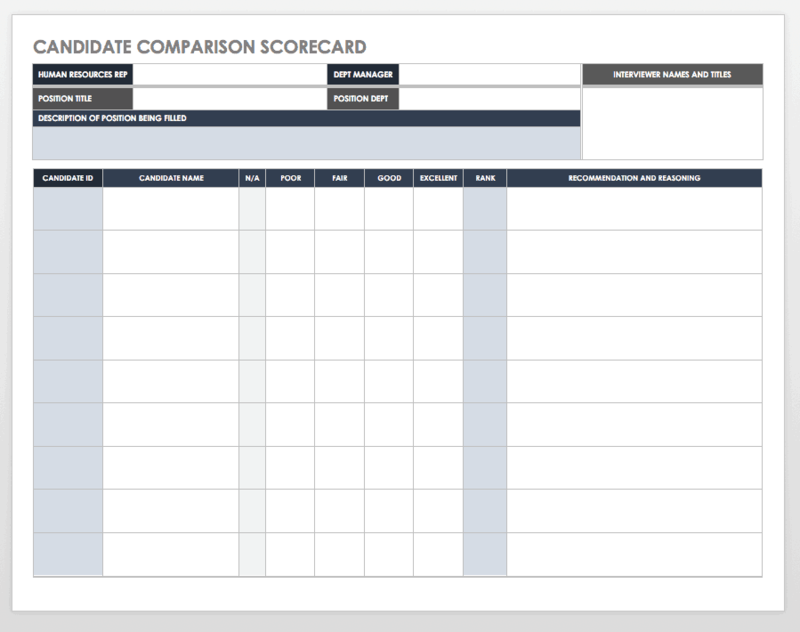 This scorecard shows the candidates side by side, along with overall ratings to help you decide which candidates will move on to the next part of a hiring process. Include interviewer names and notes to keep track of each step in making hiring decisions. Aspirations: Asking questions about a candidate’s goals or future aspirations can give you a sense of their own standards for success, whether they are looking for a long-term commitment, and how their professional development plans might fit with company objectives. Results: Gauging performance needs to be based on actual results, such as career successes, previous accomplishments for a former employer, and lessons learned from both accomplishments and setbacks. Conflict: Getting specific examples of how a candidate has handled conflict in previous work settings may provide a window into their strengths and weaknesses related to interpersonal challenges. This quality may be especially important for management roles that involve working closely with teams, facilitating communication among groups, and mediating conflicts. Making Decisions: Can the candidate provide examples of effective problem-solving? What types of decisions will they be responsible for on a daily, monthly, or annual basis? Asking questions that illustrate their leadership style and approach to handling important decisions can help you anticipate a candidate’s comfort level with taking the lead or working collaboratively when needed. Role Clarity: Asking questions to assess a candidate’s awareness of what the position entails, what role they will play in the organization, and why they are applying for the job not only provides a sense of the applicant’s understanding, but also gives them an opportunity to describe why they are the right person for the position. Cultural Fit: Looking for qualities related to personal character, professional values, teamwork, and preferred work environment or management style can help you assess how a candidate might fit into an organization’s culture. Skills and Competencies: These could range from assessing experience with specific equipment or technology to evaluating soft skills, such as communication, initiative, and leadership. They can also encompass previous experience with specific tasks, educational background and relevant training, and examples of professional experience as preparation to succeed in a particular role. Interview questions may also relate to planning and organizational skills, salary expectations, work standards, and the confirmation of or expansion upon information provided in a resume. Interview templates often have a rating scale built in so that interviewers can easily evaluate and score a candidate’s answers, and then assign an overall score based on the results. According to the Equal Employment Opportunity Commission (EEOC), discrimination is forbidden from every aspect of employment, including steps in the pre-employment process, such as advertising and recruitment for open positions, application requirements for candidates, and what interview questions are asked. In general, it’s important to ask only for information that will be used to make a hiring decision. That means avoiding topics related to gender, race, family status, age, disability, or pregnancy. Interviewers may need training in order to fully understand what types of questions could violate labor laws. A question that is intended to be friendly or personable may actually be interpreted as fishing for information that could be used in a discriminatory manner. Describe a time when you improved the efficiency of a process. How did you accomplish this? Tell me about an experience of working closely with someone whose personality was very different from yours. Talk about a time when you had to juggle multiple responsibilities. How did you handle that situation? If a manager led a project by encouraging team members to be competitive rather than collaborative, how would you react? What would you do if you realized that a project wouldn’t be finished by the deadline because of a mistake? How would you handle a coworker if you were unable to develop a positive relationship with them? Both behavioral and situational questions ask candidates to consider various scenarios, but behavioral questions focus on past experiences, while situational ones look to how something might be handled in the future. Most interviews include a combination of both approaches, along with general questions related to background and competencies. Using a scorecard to evaluate an interview provides a standardized and efficient method for ranking candidates. This method helps ensure fairness when comparing various applicants because everyone’s scores are based on the same factors. A scorecard can also be a helpful tool for comparing how different interviewers rate the same candidate. In addition, having a standardized scoring system may also provide some protection for a business if a candidate claims that they were judged unfairly or the outcome was swayed by the interviewer’s bias. Filling out an evaluation scorecard creates documentation to support hiring decisions and protect against claims of bias. Finally, another benefit of a scorecard is that it can highlight the core competencies required for a position, so important qualifications won’t be overlooked, and candidates will be evaluated based on specific requirements. Taking time to train interviewers on how to use evaluation forms and scorecards can also help the interview process go smoothly and encourage accuracy and consistency. Make sure any questions are cleared up before interviewing begins. Transform Weaknesses: Everyone makes mistakes, and you may be asked to describe a specific failure and how you handled it. Focus on what you have learned and things that you have fixed or are in the process of correcting, such as filling a knowledge gap with further training. Do Your Research: Providing a competent response for why you want to work at a certain company requires some knowledge about the organization’s background, values, and products. Stay Positive: Avoid saying anything negative about a previous employer. Even if you were fired from a position, try to frame the reason for leaving the job in a positive light. Be the Best: Employers want to know why you would be the best candidate for a job. Focus on how your experience, skills, and knowledge have prepared you to be the best fit. Maintain Focus: Some interview questions may be very broad, such as “Tell us about yourself.” When faced with open-ended questions, stay focused on your interest in the position and the relevant skills and qualities you have to offer. Going to job interviews can feel daunting, but advance preparation and practice can help the process go more smoothly. Read sample interview questions, and enlist a friend to help you practice your answers. Conducting strong interviews is a critical step in securing the top talent for your organization. To ensure that you stay organized throughout the hiring process, however, you’ll need a tool that helps you track and manage the many moving pieces.